The Egyptian Revolution started in January 2011 as millions of protestors from different religious and socio-economic backgrounds demanded the removal of Egyptian President Hosni Mubarak. The protests took place in Cairo, Alexandria, and other Egyptian cities in the forms of demonstrations, marches, plaza occupations, riots, and acts of civil disobedience and labor strikes. Some of the protests turned violent as protesters burned somewhere near 90 police stations and clashes between police and protesters killed at least 846 people. Mubarak had been ruling Egypt since the 1981 assassination of President Anwar El Sadat. Sadat was assassinated in part because he had signed a peace treaty with Israel — after long negotiations with U.S. President Jimmy Carter and Israel’s Prime Minister, Menachem Begin. Egypt’s Muslim community felt betrayed by Sadat’s making peace with the Israelis and radical Muslims carried out the assassination hoping to create an Islamic regime in Egypt (while 90% of the people of Egypt are Muslim, the Egyptian government had always remained secular). This plan didn’t work out, however, as Mubarak (Sadat’s vice president) assumed the presidency. Mubarak’s 30-year reign made him the longest-serving Egyptian president, but although he was popular with the leaders of Western nations, he was an authoritarian when it came to leading his people. The uprising started because the Egyptian people were frustrated by many issues, the biggest of which was a set of emergency laws that had been in place almost continually since 1967. These laws limited the Egyptian people’s right to free speech and prohibited all non-governmental political activity, including free elections. The laws also gave the government authority to imprison any person for any length of time for any (or no) reason, without a trial. Police brutality was commonplace. The Egyptians also suffered from high unemployment, expensive food, and low wages. 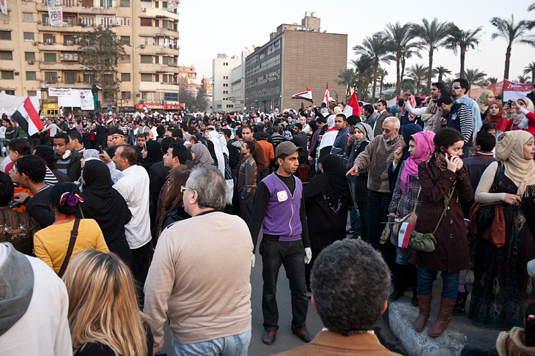 The protesters ignored curfews and took to the streets, demanding the end of Mubarak’s presidency and the emergency laws. Police remained loyal to Mubarak and tried to suppress the protesters, but police were eventually replaced by military troops, who were sympathetic with the protesters. Strikes by labor unions put extra pressure on the government. In an attempt to appease the people, Mubarak dissolved his government, replaced his vice president, and sought help from former military leaders to form a new government. The protesters weren’t moved, and as pressure on Mubarak intensified, he announced that he would not seek re-election in September 2011. Mubarak resigned from office on February 11, 2011, as a military junta suspended the Egyptian constitution, dissolved the parliament, and announced that they would rule for six months until elections could be held. In June 2012, Mubarak was found guilty of complicity in the murders of protestors and sentenced to life in prison, but an appeals court overturned the sentence, causing Egyptians to take to the streets in protest again. The Supreme Council of the Armed Forces was still leading the nation and the organization had seized some of the authority that formerly belonged to the president. Fearful that the military intended to retain power, Egyptians protested again until the military leaders announced that Islamist Mohammed Morsi had won the presidential election. Morsi was inaugurated as the fifth president of Egypt on June 30, 2012. He was Egypt’s first president to be democratically elected. But in November 2012, Morsi gave himself greater authority and decreed that his decisions were immune from judicial review. The move sparked even more protests until Morsi suspended his newly captured power (but although he claimed to capitulate to the will of the people, his leadership style didn’t change). Finally, exactly one year after he became president, on June 30, 2013, Egypt erupted in mass protests again, calling for Morsi’s resignation due to severe fuel shortages and electrical outages. Some claim the shortages were designed by Mubarak supporters — Egyptian elites who wanted to cause a second revolution. The military stepped in again and stated that if the protesters’ demands were not met by July 3rd, they would “build a road map for the country.” While this suggested a military coup was coming, the Egyptian military claimed to have no intentions of ruling the country long term. As the July 3rd deadline came, the Egyptian military again suspended the constitution, dissolved the parliament, and established an interim government until a new election. This interim government is in place now and has the support of the military and all major previous opposing parties, but it’s opposed by the Muslim Brotherhood (the Arab world’s oldest, most influential, and one of the largest Islamic movements) so it’s hard to say if Egypt’s political unrest is finally in the past. Addendum: In August 2013, violence and protests again erupted in Egypt. Supporters of deposed president Morsi took to the streets in protest, while an Egyptian court ordered the release of former president Mubarak from prison — an event that may not come to fruition but could fuel unrest across Egypt. Some news sources claimed that more than 900 Egyptians were killed by security forces during the first week of the protests. Many world leaders and regional experts agree that Egypt appears to be headed towards full-scale civil war.